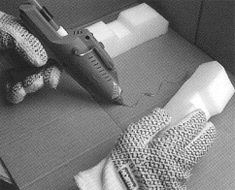 SuperTak Contact Adhesives: Solvent based contact adhesives packaged in 5 gallon pails or safe, easy to handle aerosol cans. They deliver reliable bonds in a variety of applications. Cyanoacrylate and Epoxy Adhesives: Form permanent bonds to most substrates. They come in one and two-part systems and a range of cure times. Hot Melt Adhesives: Offer a quick and economical way to bond a wide range of materials; wood, metal, glass, plastics, coated and uncoated cardboard. Available in glue sticks and bulk form. Liquid Adhesives: Complete line of advanced solvent and water based adhesives commonly used in product assembly, aerospace, and transportation industries. Urethane Construction Adhesive: A superior construction adhesive for subfloor assembly and many other general construction applications. Contact us for advice and product samples to test in your application.